Thick 1 1/2" tops make a decidedly upscale impression. High-pressure laminate top with ribbon edge is abrasion- and stain-resistant. Cord management grommet routes cords and wires. Full-height modesty panel provides privacy. 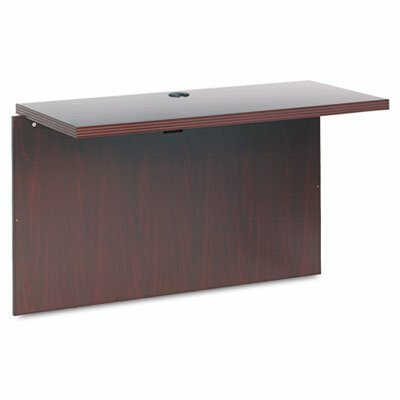 Connects Single Pedestal Desk to Single Pedestal Credenza to form a "U" workstation. Color: Mahogany; Overall Width: 47"; Overall Depth: 24"; Overall Height: 29 1/2". Connects Single Pedestal Desk to Single Pedestal Credenza to form a "U" workstation. Thick 1 1/2" tops make a decidedly upscale impression. High-pressure laminate top with ribbon edge is abrasion- and stain-resistant.